“Jesada Technik Museum (“Technik”: German)”. It is a museum that collects and show vehicles, engines, vehicles on land, on water and on air.There are many different types from all over the world such as small cars, cartoon cars, Russian submarine, Boeing 747, Tri star. The producing from steel, stainless and paper.Hood as an adhesives paper and remaining of cloth. Do same as a papermache, car about 70% can also work. Situation: 100 M.2 Ngiew Rai, Nakhonchai-sri, Nakhon Pathom, Thailand. It’s name “Jesada Technik Museum (“Technik” German )”. 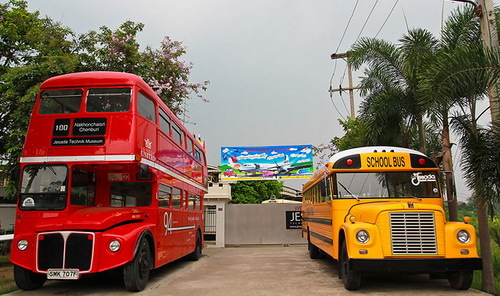 The founder of “Jesada Technik Museum in Thailand” is Jesada Detsakulrit. The owner of this museum is a rich man, like to travel around the world and like to buy antique car for collect antique car. 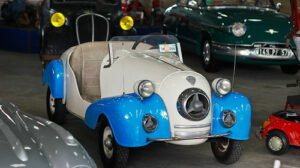 His first car is Messerschmitt KR-200 year 1958 and bubble car. Until, vehicles have accumulated more than 500 cars. From big vehicle such as airplane, helicopter, tank, bus, car, cartoon car, motorcycle, three-wheel car and bicycle. The purpose for built antique car museum is open for those interests. Especially with children and youth to visit the antique car museum in children’s day every year. This museum will have activities for the Thai child and can come to join every activity free. Every Tuesday-Sunday 09.00 a.m.- 05.00 p.m. and don’t count any admission fee.